The First 25 is the first step towards coastal cruising at all speeds, and she is loved for her sleek sporty line. Combining performance, good habitability and great comfort, she is available in a keel boat version or with a lifting keel. The First 25 stands out under sail for her slender profile, attractive hull decoration, and generous sail plan. 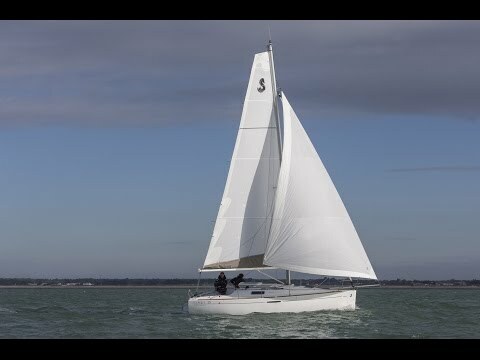 With her unstayed rig, she is equipped with a square-top mainsail, a furling genoa, a 2016 code 0 and an asymmetric spinnaker (on option), making sailing faster and more enjoyable. The First 25 has a level of comfort and habitability that allows cruising. By building the mast prop into the forward bulkhead this creates generous space in the saloon, enhanced by light-coloured teak woodwork. With a double fore cabin, lots of stowage, a washbasin, heads and two berths in the saloon, her capacity is good.